Early childhood arts integration and STEAM lessons appear to be easy at first glance. After all, don’t we do this stuff already with our youngest students? Yes and no. It is best practice to encourage play and discovery in grades PreK-1. And many teachers use the arts on a daily basis for their lessons. But it’s not integrated. Instead, the arts are used as an enhancement tool to make a lesson more fun. So when it comes to something like a Force and Motion Lesson, you may think that splatter paint is just another “fun” way to demonstrate these concepts. But that’s not the case with this free STEAM lesson! In this lesson, we are intentionally connecting the visual art standard of creating collaboratively with the science standard for teaching the effects of push and pull in force and motion. But both of these are big concepts for small children! So we turned to one of the great action artists: Jackson Pollock. His work can be seen in museums all over the world and while it stirs up the controversy of “I could do that” all over again, it’s in his process that we find the link. In this lesson, students get the see how Pollock created his art work using large canvases and different angles (laying the canvas on the floor and splattering paint as an example). This is perfect for young students! Young children see the world differently than adults, both literally and figuratively. Why not use that within a lesson? Kids love the idea of painting from different angles and the fact that Pollock is so “messy” is a plus, too. This makes for an easy transition into the question of WHY the paint creates that splattered effect. This lesson uses those forces of push and pull in the learning activity. After investigating Pollock’s art, students then use marbles and paint to create their own action art using the principles of push and pull. They must also consider what colors will work well together as the paint begins to mix once the container is tipped and the marbles begin moving. For more free arts integration and STEAM lessons like this, visit our Lessons Page! 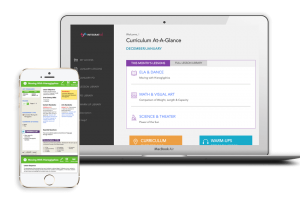 Need an Arts Integration and STEAM Curriculum? Fully-developed lessons, assessments, student handouts, powerpoints and warm-ups are all waiting for you.